First of all, The School of Kyiv biennial aims to propose a new discourse of Ukraine. Ukraine needs a narrative elaborated with its all specificity and perceived internationally. Until recently Ukraine had always been de-subjectivized and absent from the mental map of Europe. It is an untold story, which requires a new articulation – a coherent representation of local issues in a universal political language. Representation is the basic artistic and political problem being tackled at the Kyiv biennial. Representation means gaining political subjectivity – being present, visible, and voiced as a separate entity. Ukraine is now often mis- or falsely represented, even if it itself is to blame for this. The Kyiv biennial provides the tools to narrate Ukraine through involving local and foreign institutions, artists, and intellectuals debating how to define reality – that is, how to find the proper language to grasp it. The School of Kyiv is a continuation of the idea of the Maidan, operating as a political agora in the cultural field. The Kyiv biennial is the international Maidan of culture, a vehicle for the incorporation of progressive collective practices in Ukrainian society intended to spur social change. We want Ukraine and Europe in general to go back to school and to study themselves. Now it is time to learn our lessons. The School of Kyiv reformats and reframes the very concept of the biennial, being self-organized from below with solidarity and support from different institutions and cultural actors. The institutional importance of The School of Kyiv lies in the engagement of those local institutions that have always been on the margins of the field of contemporary cultural production (such as the House of Artists, the National Academy of Arts, the Academy of Fine Arts and Architecture, the National Museum of the History of Ukraine, or the National Library for Architecture). The traditional artistic and social structures inherited from the past are combined with the engaged NGOs, volunteer networks, and self-organized social centers that appeared during the Maidan uprising and as a social response to the Russian-waged war and occupation of Ukrainian territories afterwards. The institutional framework of the biennial, held in 18 locations across Kyiv (and in 15 venues outside Ukraine), shows the city itself. The biennial is the School of the real Kyiv: it portrays the cultural, urban, and political landscape of Kyiv, drawing a picture of the city that allows the Kyiv context to speak for itself. The topology of The School of Kyiv unfolds through its concepts and locations, proposing a new Kyivan path. Its future is not guaranteed, its traps and obstacles are unknown. In fact, we are starting a grand experiment, and we don’t know what lies ahead of us; however, we aim to create new public spaces for thinking and reflection that can be sustained in the future. The Kyiv biennial is neither an art market nor a sort of spectacular entertainment – it is a school, and we are all studying there together. The School of Kyiv is based on the idea that the event in Kyiv is establishing an a priori for the continuation and development of post-biennial structures, building up a new institutional network on an international scale. The biennial is not an action, but a process; it is not a ready-made product, but a work-in-progress. We all have to study today. That’s why the notion of ‘school’ became the main module and structural component of the Kyiv biennial. Taken together, the six Schools of the biennial – of Abducted Europe, of Image and Evidence, of the Displaced, of the Lonesome, of Landscape, and of Realism – are trying to frame the main political affects of the present day, proposing a vocabulary with which to speak. Establishing a school, a university, or any other educational project is the best task to undertake after a revolution. Learning is the finest antidote to counter-revolution, especially in the form of war. We are in the right time – after the Maidan – and in the right place – Kyiv, a key city for today’s Europe – to implement that. The School of Kyiv is a way of representing our recent and past political and social experience. We need to work through what we have lived through – without repression or negation, but with full awareness of our responsibility for the possible outcomes. We want Ukraine and Europe in general to go back to school, to sit down at a school desk, and to study themselves. Now it is time to learn our lessons. Ukraine is an untold story, which requires a new articulation. The School of Kyiv is open and invites everyone to attend its classes and events. Today we are all going to our first class, and we start with learning the alphabet. Meaning is use, as Wittgenstein claimed, which is why our initial political task is to understand. We are trying to understand together. “To understand” fundamentally means “to exist among”, “to be present between”. To understand ultimately means to be closer to your neighbor. The School of Kyiv is not just public debates and exhibition projects with invited participants. These are the biennial media, the superstructure of The School of Kyiv . The biennial as an inter-institutional and multidisciplinary structure is a biopolitical entity enabled and produced through common lived experience. The biennial is first of all the people experiencing the real School of Kyiv, gradually elaborating the biennial biomechania in the base zone. The School of Kyiv is a practice. Originally meaning “leisure” and also “that in which leisure is employed” the notion of school presupposes the proper use of otiose time – for learning, conversation, debate, and meeting. Free time is time for emancipation. School is the practice of freedom, which like the practice of language or love has a beginning but no end. The School of Kyiv is that in which the power of generation is employed. 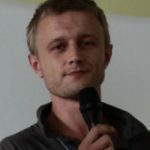 Vasyl Cherepanyn is the director of the Visual Culture Research Center (VCRC) in Kiev, a platform for collaboration between artists, activists and academics. He is the editor-in-chief of Ukrainian Political Critique Magazine and the institutional organiser of The School of Kyiv – Kyiv Biennial 2015.